These Ruby and diamond drop earring with halo are a gorgeous accessory for every day and night! 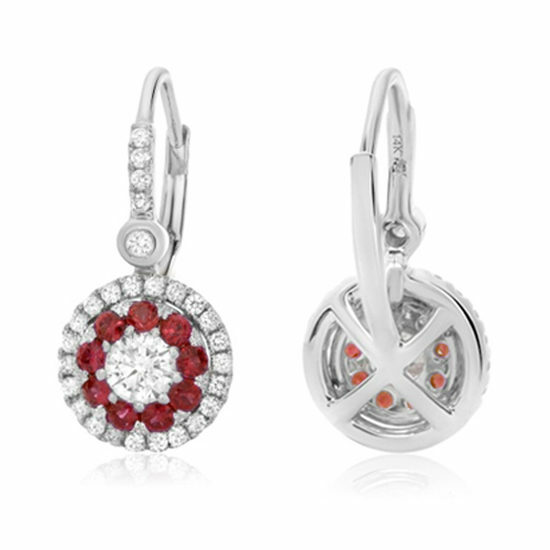 The rubies and diamonds light up any complexion and are completely flattering to any silhouette. Shown in 14k White Gold. Featuring a 0.38 carat G/H Color SI1/SI2 Clarity Round Brilliant Cut Center Diamond, surrounded by 0.40 carats of Rubies, with 0.26 carats of Round Brilliant Cut Diamonds in the halo and top of the earring.